Angry Birds has proven to be such a runaway success on mobile devices—100 million downloads can’t be wrong—it shouldn’t come as a great shock that game makers are trying their hand at recreating Rovio’s winning formula. Count World Wrestling Entertainment among those hoping to cash in on the Angry Birds phenomenon with its own physics-based puzzler, WWE Superstar Slingshot. In this $2 game, the angry birds have been replaced with muscle-bound wrestlers. There’s no word on whether or not the wrestlers are angry, but if they’ve spent any amount of time playing Superstar Slingshot, I’d wager they’re more likely to be bored out of their minds. The idea behind WWE Superstar Slingshot is that you’ve been stripped of your title belt, and you’ve got to earn it back in the ring—the ring, in this case, being comprised of structures assembled out of wood, steel, and other assorted materials that protect a rival grappler from his justly-deserved whooping. You’ve get three chances to catapult your WWE superstar off the ring ropes and through the air in order to smash the structure, crush your opponent, and move on to the next stage. 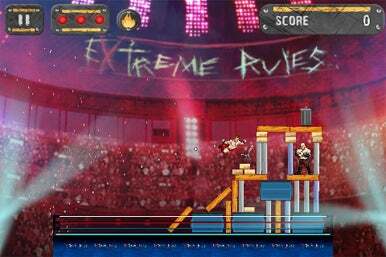 The game offers 15 levels in all, each built around a WWE program or event and culminating in Wrestlemania. With nine stages included in each level, you’ve got 135 puzzles to bash your way through on your way to regaining that coveted championship. What Goes Up...: Replace the birds in Angry Birds with wrestlers, and you’ve got WWE Superstar Slingshot. Be sure to also replace the fun of Angry Birds with mind-numbing tedium. Again, swap out John Cena and Randy Orton for the blue bird that splits into three and the white bird that lays exploding eggs, and there’s nothing in WWE Superstar Slingshot you won’t find in Angry Birds. So why does the latter game soar while the former one flops about the ring? Because Superstar Slingshot completely ignores the little details that make any of the Angry Birds offerings so enjoyable. Start with the use of WWE superstars—you can choose from 10. But other than the manner in which they fly through the air, the wrestlers are pretty much interchangeable; contrast that with Angry Birds, where the birds have unique talents and can bash through different materials with varying levels of success. When you start a level on Superstar Slingshot, the game zooms in on your wrestler, preventing you from seeing the structure you’re supposed to smash. You can zoom out, but then you lose much of the graphical detail that might otherwise help the game stand out. Speaking of lost details, one of the things I enjoy about Angry Birds is how the green pigs you battle become more bruised and agitated the closer you get to toppling them. That doesn’t happen in Superstar Slingshot, where your rival wrestler simply disappears in a puff of smoke the moment you make contact. When you successfully solve a puzzle, the game jumps to the next stage before the pieces of the structure stop toppling, depriving you of the thrill of seeing the full impact of the destruction you’ve wrought. You can replay levels, but Superstar Slingshot doesn’t record your high score-just your overall score—which gives you little incentive to relive past challenges. It’s possible WWE enthusiasts might thrill to a game that depicts the heroes of the squared circle, though really, the graphics are cartoonish and not terribly impressive. As someone who can trace his fascination with wrestling to the days when Hulkamania was running wild, I found this a disappointing attempt to ape the Angry Birds experience. There’s certainly no shame in trying to throw together a knock-off of a vastly superior game; there is a problem when that knock-off is as boring and uninspired as Superstar Slingshot turns out to be.